Great addition for salads, stews and some other main courses. Ripeness of peas is especially looked for. Product is labelled with mark Green leaf and text “Without preservatives” because production process involves method of pasteurization just like home made. Therefore it means that after opening they should be kept refrigerated. Shelf life unopened – 36 months. 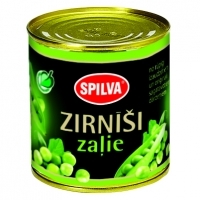 The product is filled 0.42 l metal cans. Product 100 g contains: energy value – 60 kcal (251 kJ), carbohydrates – 9.7 g, protein – 4.2 g, fat – 0.3 g, salt – 0.7 g.